Andrew, I mean Edu, released a brand new song today called “Tomorrow And Today” by way of the Italian music blog www.ondarock.it. But the song isn’t actually brand new. In fact, it was intended to be on Tally Hall’s “Good & Evil” (notice this has the recurring “And” in the title, as well). If you say “Tally Hall” here in Italy it means nothing, but go across the ocean to discover that in the U.S. this sweeping pop quintet of colored ties, active since 2002, is the subject of a good bit of devotion. 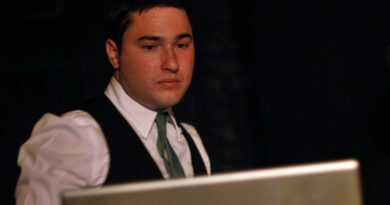 While the band is in the midst of a pause for reflection, the “green tie” Andrew Horowitz, keyboardist and composer of songs of the group, has embarked on a solo career with the moniker of “edu” (pronounced ee-doo). The same sense of intimacy and sweet innocence that emanates from what was the childhood nickname of Andrew is reflected now in the music of Horowitz, a lo-fi pop in pastel shades on which occasionally light a vaguely uneasy psychedelia. All of this is found in the atmospheres of “Today And Tomorrow”, a song originally written for the second work of Tally Hall (“Good & Evil”), but never appeared on that album. “I tend to treat the songs as matured meat,” he admits Andrew. “I let it rest until they become soft and ripen.” And the right time to taste the best delicious “Tomorrow And Today” has finally arrived with OndaDrops. More is coming down the pike from Edu, including music video(s), and we’ve still got that interview with him which we’ve got saved up… and hope to publish along with the first video debut. For now, here’s Tomorrow And Today!